Hey there guys! So its time for a makeup post! Its been awhile so I thought it was about time. 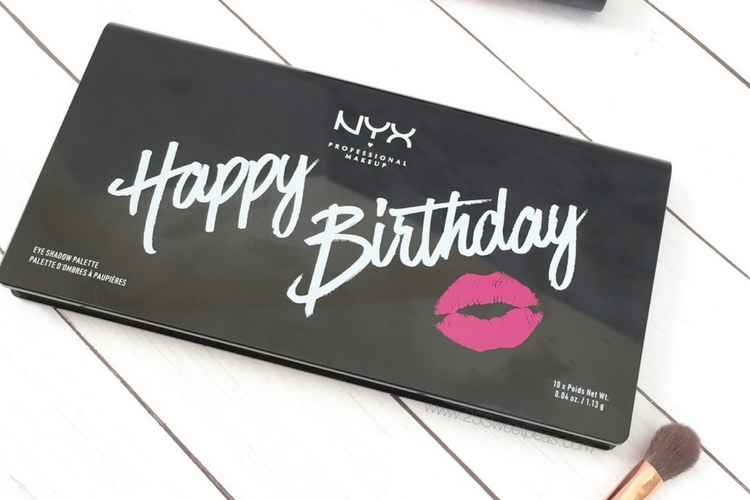 Today we are going to chat about the NYX Happy Birthday eyeshadow Palate. So lets get into it! Here is an unclose look at all of the shadows. This palate comes with 10 shadow's and it is a full sized palate which according to the receipt is valued at $19. The packaging is nice and sturdy, and its a really nice range of colors. Great as we move into the fall months and or if you are obsessed with warm tones! It has a full sized mirror in the lid and over all presentation is really nice and feels nice. Now on to the swatches.... I have numbered them just to help you guys out. They don't have any particular names so numbering seemed the most efficient way to go about things! :) When I first saw this combo of colors I was super excited. I am all about marsala and was excited about the green because I do kind of want to branch out more. So when I got it was excited about using it. I tried it with both brush and my finger. (for Arm swatches I used finger) Honestly it was all a bit of a let down. The shadows are quite chalk and not very pigmented. As you can see in the swatches some struggle to even show and others are just spaced out if that makes sense. #1, #3, #6, and #9 seem to be the best when swatching but on they eye they are still super light. I think out of all of them on the eye #3 shows up the best. However its not a super great color on me personally, its got a hint too much orange which kinda can appear reddish and then look like you have been crying. Ekk, yeah I don't like that. #9 goes on fairly dark but doesn't look very burgundy/marsala like which was a bummer. That all being said even if you get some of the colors to show, they don't last. I tried out the palate 2 different days and one evening and each time the colors that I did finally get to show were barely nothing within an hour which was disappointing. Such a bummer you weren't super thrilled with it. The colors look nice. It really is a great selection of colors! Those colors are so pretty! And I love that NYX is cruelty-free. Such a bummer because the colors look so nice. Usually NYX shadows are better than that! I felt similar at first but after using it more I love it for quick on the go looks.